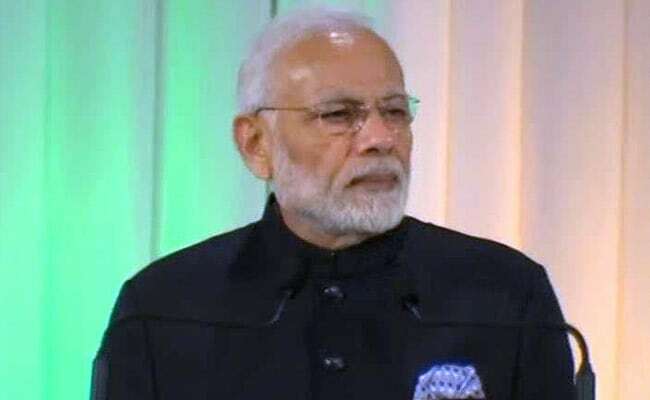 PM Modi in Japan: In Tokyo, Prime Minister Narendra Modi and Japan PM Shinzo Abe will hold a formal summit, during which economic cooperation and strengthening bilateral security is expected to be high on the agenda. We have agreed for a 2+2 debate, PM Modi said during the joint statement. Prime Minister Narendra Modi started his second day of the Japan visit by addressing the Indian community in Tokyo. Yesterday, PM Modi spent eight hours at the scenic Yamanashi at his Japanese counterpart Shinzo Abe's holiday home, before taking the express train to Tokyo this evening. The two Prime Ministers held informal talks over lunch and a private dinner and also visited Japan's largest facility for building industrial robots. 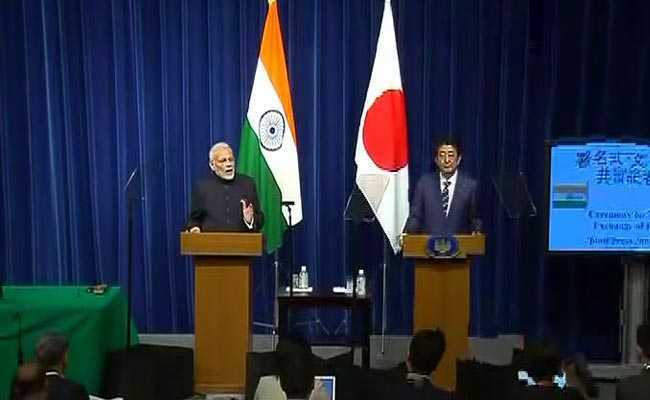 After addressing the Indian community, PM Modi will attend the 13th India-Japan annual summit, where the two nations are expected to deepen their strategic ties and build synergy across various fields. India and Japan have drawn closer as China's power in Asia has grown. Tokyo is worried about Chinese activity in the Western Pacific. Delhi wants to keep Beijing influence out of the Indian Ocean. In 2015, Japan's Maritime Defence Force became a regular participant in an annual naval exercise, known as Malabar, that the United States and India began in 1992. 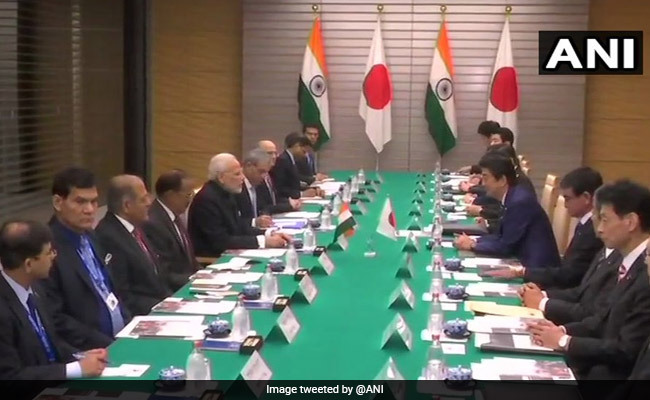 India and Japan have signed a $75 billion bilateral currency swap agreement on Monday during PM Modi's visit to Tokyo, India said in a statement. PM Modi was accorded a ceremonial welcome at the PM Office @kantei. Shinzo Abe joins PM Modi during the inspection of Guard of Honour. India and Japan have also decided to cooperate for the first time in the areas of Indian traditional medicinal systems such as Yoga and Ayurveda to provide holistic healthcare and wellness in both the countries. The Memorandum of Cooperation (MoC) between India's Ministry of AYUSH (Ayurveda, Yoga and Naturopathy, Unani, Siddha and Homoeopathy) and the Kanagawa Prefectural Government was signed during PM Modi's visit to Japan. PM Narendra Modi and Japan PM Shinzo Abe hold delegation level talks in Kantei. Contribute, Co-exist to Conquer Hearts! Some years ago, I spoke about making a mini-Japan in India. It's a matter of great happiness for me that today, you are working in an even larger number in India. When I took over the responsibility of the government in 2014, India was at 140th position in the 'ease of doing business' ranking of the World Bank. 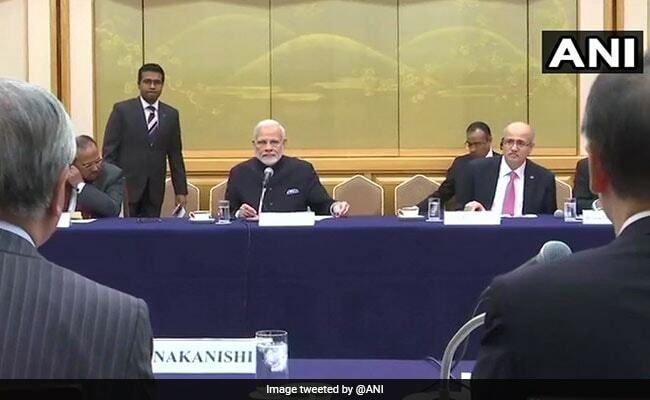 Prime Minister Narendra Modi at India-Japan business leaders forum in Tokyo. PM Modi interacted with top business leaders from India and Japan at Business Leaders Forum. 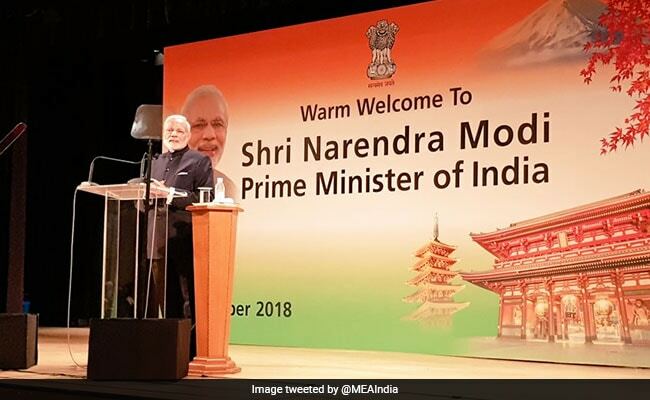 PM said that inputs offered at the Forum will propel India to achieve global benchmarking and urged Japanese businessmen to engage more with India. PM Modi with Secretary General of Liberal Democratic Party Toshihiro Nikai. PM Modi with Foreign Minister of Japan, Taro Kono. PM Modi met Hiroshige Seko, Minister of Economy, Trade, and Industry (METI) of Japan. 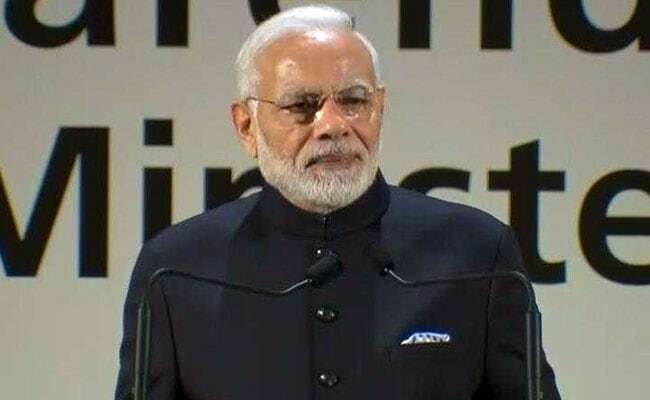 Prime Minister Narendra Modi congratulated the Indian community in Japan for taking 'brand India' to new heights by introducing cricket, Indian food and culture to the island nation, which has long worked with India in several sectors such as infrastructure, auto and technology. 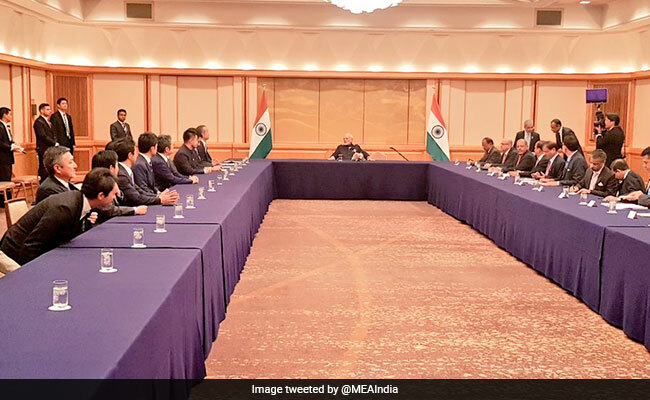 PM Modi interacting with some respected names in Japanese venture capitalists. India is going through a massive transformative phase today. The world is appreciating India for its efforts towards services towards humanity. The policies being made in India, the work being done towards public welfare, for these the nation is being felicitated today. Today India is making tremendous progress in field of digital infrastructure. Broadband connectivity is reaching villages, over 100 Cr mobile phones are active in India, 1 GB is cheaper than a small bottle of cold drink. Make in India has emerged as global brand today. We're manufacturing quality products not only for India but for world. India is becoming a global hub, especially in field of electronics and automobile manufacturing. Last year our scientists created a record by launching over 100 satellites into space simultaneously. We sent Chandrayaan and Mangalyaan at a very low expense. India is preparing to send Gaganyaan into space by 2022. We celebrate Sardar Patel's birth anniversary every year, but this time we will grab the attention of the entire world. In Gujarat, which is also Sardar Patel's birth place, we are building the tallest statue (his) in the world. The two leaders have had lunches and dinners over the last four years but this time, they got around to something that they seemed to have missed during their past meals together - chopsticks. PM Modi received chopsticks lessons on his third visit to Japan as prime minster. 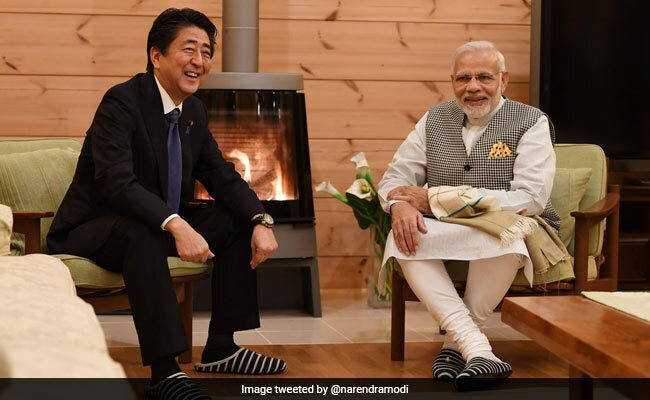 His instructor was Mr Abe, who called PM Modi one of his "most dependable friends" and hosted him at his holiday home in the village of Narusawa, Yamanashi. 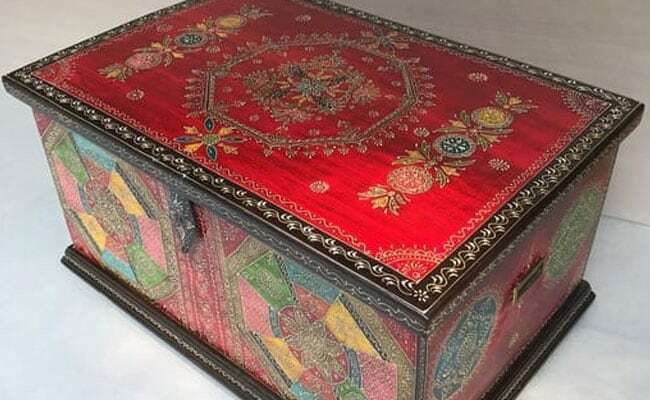 A Jodhpuri wooden chest from Rajasthan with traditional work was also presented, an official said. Hand-woven by the master weavers of Mirzapur in Uttar Pradesh, the dhurrie designs show the diversity of possibilities available -- from a symmetrical repeating geometric tessellation in one, to stylistic floral motifs arranged around the classical medallion pattern in another. 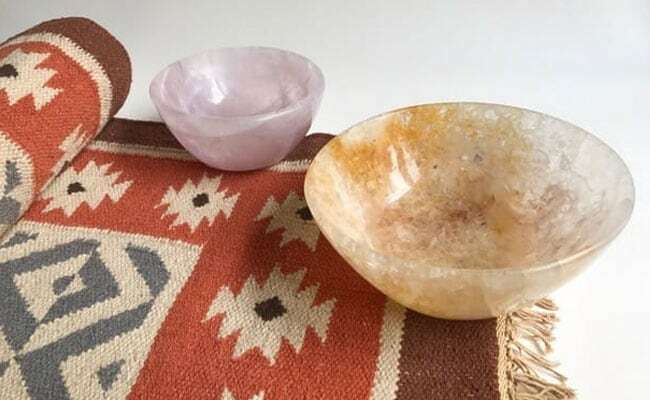 Prime Minister Narendra Modi presented his Japanese counterpart Shinzo Abe two handcrafted stone bowls and dhurries made from rose quartz and yellow quartz stone sourced from Rajasthan. The bowls were crafted by master artisan Shabbirhusen Ibrahimbhai Shaikh of Gujarat's Khambhat region, which is known for its practice of stone craft since generations and is also a leading hub for exports of stone products from India. Later in the evening, Japan PM Abe in a special gesture hosted PM Modi at his personal villa near Lake Kawaguchi in Yamanashi for a private dinner. It was the first time Japan PM Abe had invited a foreign political leader to his holiday home in the village of Narusawa in the prefecture. PM Modi, who arrived in Japan last evening to attend the 13th India-Japan annual summit, was accorded a warm welcome on his arrival and the first day of his visit was characterised by special gestures and warmth. PM was affectionately received by Japan PM Abe on his arrival at the Hotel Mount Fuji in Yamanashi prefecture, west of Tokyo. The two-day summit beginning Sunday seek to review the progress in ties and deepen strategic dimension of the bilateral relationship.